This watch is quite possibly the ugliest one ever made. But it isn’t trying to impress you with its looks – what matters is what’s on the inside. And on the inside of this behemoth is a tiny atomic clock. The clock is so accurate that it only loses one second every thousand years. This monster watch will still be telling accurate time long after your personal clock runs out. 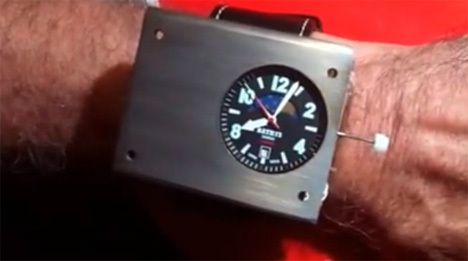 Although many current electronic devices sync to a distant atomic clock, this seems to be the first time an actual atomic clock has been made into a wearable accessory. The watch operates on a Symmetricon SA.45s CASC chip, which could be called a miniature atomic clock. The chip and the standard watch innards are contained in a shiny metal case that is roughly the size of a deck of cards. This version of the watch isn’t final – watchmakers Bathys want to refine the appearance a bit. But when the design is finalized, only 20 of these babies will ever be made. At a price of $12,000 each, though, you would have to be really, really dedicated to keeping accurate time to splash out on one.